We still don’t have electricity at home. Its been out now since 10am Monday. Ruby telecommutes from home so she’s a digital nomad today. Yesterday evening we saw what may be the cause of our power outage. A big ole’ electrical pole has snapped off at the top. The only thing keeping it off the ground are the wires. 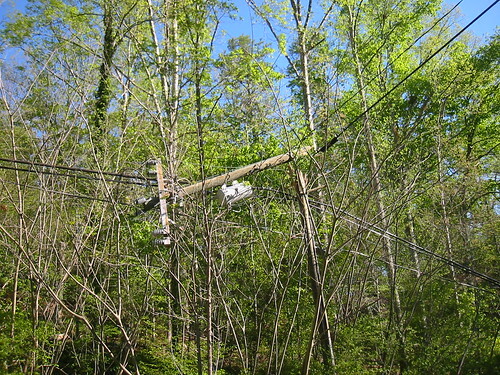 A large tree fell on the line. Must have had lots of force to snap such a thick piece of wood.